German rock band Bonfire have been around since 1986 (a decade or so longer if you count the band Cacumen which evolved into Bonfire), and over that time have released a steady stream of albums – by my count, this is their 15th studio album, but they’ve also released half a dozen live albums plus a number of compilations. Over the years they’ve had plenty of lineup changes, the most recent of which was when Alexx Stahl joined as their new singer in August 2016. After so many years with Claus Lessman on vocals (followed by a couple of short term vocalists), the band appear to have found a worthy replacement with Alexx Stahl – he’s got a great voice, and Hans Ziller is certainly happy. It’s a great album with a good mix of songs. You’ve got the power ballads – “Comin’ home” and “I’ll never be loved by you”, heavier songs such as “Temple of lies”, and some lighter songs. There are good catchy choruses too. It’s an album that compared favourably against the band’s previous few albums and shows a band firing on all cylinders. Check out the video for “Crazy over you”. 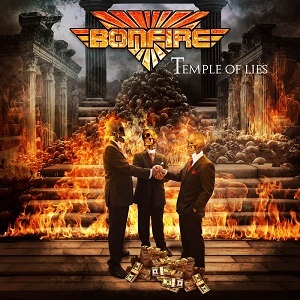 Bonfire fans will love this album – a definite return to form. If you haven’t listened to Bonfire before then this is an album that’s definitely worth a listen – it’s a great rock album. 12. Friedensreich II – The return of the Zunsler into the T.O.L.